To Beaver or not To Beaver – That is the Question! | Oh Canadiana! ← To ‘Occupy’ is not an Occupation! And who is this Nicole Eaton to decide for the rest of Canadians anyway? An arrogant politician who is inept to deal with real issues in this country so she puts her nose into issues that is not up to her to decide anyway. Arrrhhhh! I am sick and tired of these people who just have no idea why and what are they getting paid for. I say too, that leave the beaver alone! It is the perfect fit to be Canada’s ambassador! 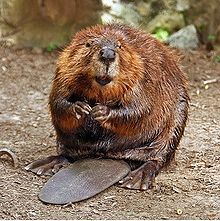 I wasn’t born in Canada, I adopted this country and the very first thing I wanted to see in my adopted country was the beaver. Never thought of the polar bear nor do I see it as Canada’s mascot. Mr. Beaver will stay my mascot of this country and that is just how it is going to be! What a great symbol you are for Canada, Mr. Beaver!! I give this whole article thumbs up! No polar bear mascot for me!